Celebrate Oregon State University’s 150th anniversary with your own limited-run OSU150 commemorative blanket designed and produced by Oregon’s own Pendleton Woolen Mills. This 64" x 80" queen-sized blanket is made of 100 percent virgin wool and is perfect for chilly Pacific Northwest nights or as a decorative piece within your home or office. 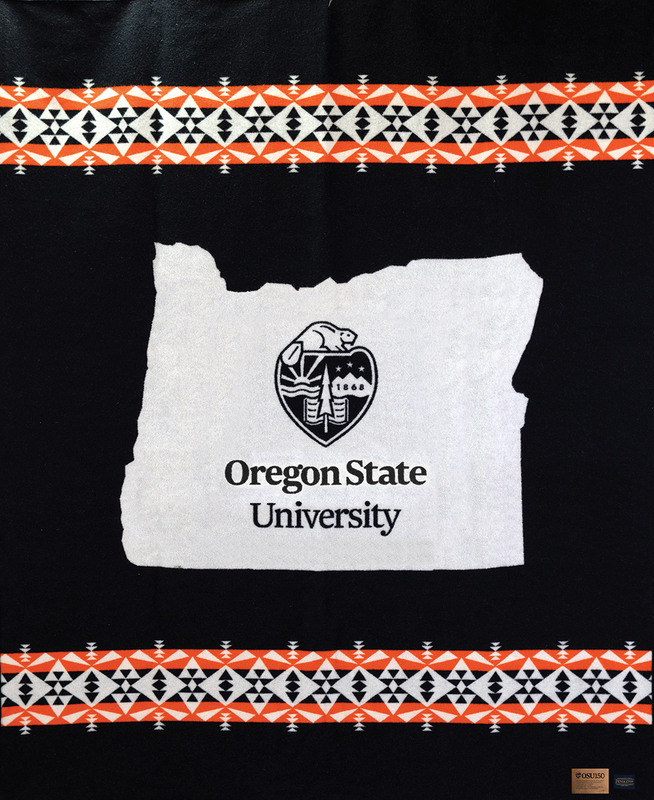 This richly designed blanket features a black background, the silhouette outline of Oregon’s state borders in white, a colorful orange and black Native American-style banner at its top and bottom, and the university’s crest and name in the center. Each blanket features an in-laid leather patch in one corner commemorating OSU’s 150th anniversary and the university's mission of providing high-quality education and prosperity for all people. Don’t wait to place your order. Shipping is included in the purchase price and the blankets will be mailed to your billing address. Please contact us with any questions. The OSU150 blankets from Pendleton Woolen Mills are now sold out. Sign up to get notified first about future projects.